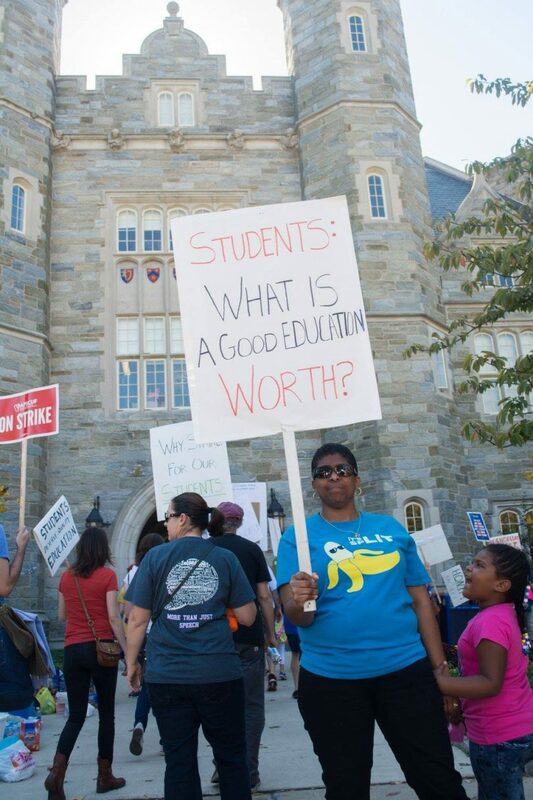 This Thursday will mark the two-year anniversary when the APSCUF strike began across the entire PASSHE system of colleges. Lasting three days from the 19th-21st of Oct. 2016, hundreds of professors and other faculty members went to the picket lines to strike for a new contract that they felt would be more fair to them. Now, two years after the strike began, with discussions between APSCUF and PASSHE about contract renewal starting up again in this coming January, a big question looms surrounding the anniversary: could a strike happen sometime in the near future? But for some residents of Pennsylvania, what could have possibly led to the very first strike within the history of the PASSHE system remains somewhat unclear. Although, there was no watershed moment — instead there was a series of events that started years before the strike took place. The problems began with the appointment of Frank Brogan as chancellor of the PASSHE system in 2013. Frank T. Brogan, longtime member of the Republican party and former lieutenant governor of Florida alongside Jeb Bush, greatly worried members of the Association of Pennsylvania State College & University Faculties (aka. APSCUF). Months After Brogan was appointed as Chancellor of PASSHE Pennsylvania State System of Higher Education), on Dec. 12, 2014, negotiators that were representing APSCUF announced in a press statement that on June 30 of the following year, the collective bargaining agreement between APSCUF and PASSHE would expire. Following that, APSCUF announced that negotiators between the two groups would meet in Harrisburg on March 20, 2015 to draw up a new contract, but the talks would be pushed back to June. Before negotiations between the two parties were set to begin, members of APSCUF took steps to prepare in case a strike did happen if the talks between APSCUF and PASSHE would break down. According to an article that Professor Kahn wrote in “Works & Days: Three Days in October,” In January of 2015, members of APSCUF gathered in the state capital to make changes to protocols and timetables for a strike, and revising the “Strike Manuel to add the Strike Team as a layer of leadership.” These changes would later be contributed to the success of the APSCUF strike in 2016. Negotiations officially began on the morning of June 12, 2015, but when members of APSCUF met with representatives from the state system, talks quickly broke down between the two. This hostility between the two groups would continue as the representatives from the two parties met time and time again to discuss terms for a new contract, but PASSHE refused to accept the terms of compromise laid out by APSCUF. This inability for the two parties to come to terms would result in faculty members across the PASSHE system working for months without any contract. Increasing the number of adjunct professors, already 30 percent of faculty, and slashing their pay by 20 percent, II.) Transferring faculty to places the university sees advantageous (so a WCU professor, for example, can be forced to another university), III.) Slashing scholarship and research so the professors are solely instructors (APSCUF negotiations team said PASSHE disparaged them as ‘teaching robots’ and believing they ‘only work 17 hours a week’) IV.) Health care cuts plan changes that would increase the out-of-pocket expenses for employees. For three days, members of APSCUF stood at the picket lines with signs in one hand, and a megaphone in the other, with students operating along with them to provide food and water to the strikers. Eventually, after round the clock heated negotiations with each other, the two parties finally came to an agreement on October 21. In the terms of the new contract, APSCUF agreed to make concessions to salaries and benefits in exchange for termination of the 249 changes that chancellor Brogan proposed earlier that year. And then in December of that same year, APSCUF and PASSHE ratified the new contract with an almost unanimous vote. Months after the ratification of the new contract, in September of the following year, Frank T. Brogan resigned as chancellor of the PASSHE board, and now currently works for President Trump in the Federal Department of Education. Following the departure of Brogan, and an interim chancellor, the PASSHE board appointed Dr. Daniel Greenstein as the new Chancellor of the PASSHE system on September 6. Dr. Daniel Greenstein, prior to becoming PASSHE chancellor, was the director of the Postsecondary Success Program of the Bill & Melinda Gates foundation, and served as vice provost of the University of California system prior to his time with the Bill & Melinda Gates Foundation. Today, with negotiations for contract renewal set to take place in January, and after becoming more familiar with the new chancellors background in education, some members of the faculty union are optimistic, but cautious. On this two-year anniversary of the APSCUF strike, tensions between members of APSCUF and the PASSHE board seem to be at a calm period, but it still raises the question of whether tensions will remain calm after the two parties meet again in January, or is it simply the calm before the storm?